Versatile enough for your morning Cafe au Lait and your late night Whiskey on the Rocks, the Bodum Pavina is a set of two 8 ounce double wall insulated tumblers. Each double wall glass is handmade by expert artisans. Because this glass is mouth-blown, each one may have slight differences in height, thickness and weight. These glasses will help to keep hot drinks warmer and cool drinks cooler. For best results retaining heat, pre-heat the glass before use. 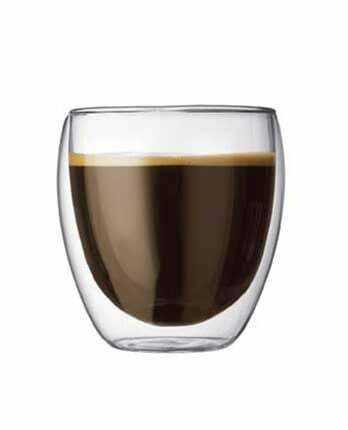 Unique - Use them for hot, cold, tea or coffee, this glass will suit any type of drink that suits your fancy. The unique shape and double wall feature will keep your drinks hot or cold for a longer period of time and protect your hands from burning with hot drinks. Hand Wash Only -To make sure water doesn't seep between the double wall feature, we advise you to hand wash these glasses versus putting them in the dishwasher. A unique design and shape that stands out from the average glass, the double wall feature makes it stand out from the rest of them. Please use care when placing ice into the glass to avoid fracturing the inner layer. We suggest placing the liquid first and then the ice. Please also avoid using metal spoons or placing the glass into a crowded dishwasher. For detailed care instructions, please refer to the user manual. We recommend that you also incorporate the following into your cleaning routine: Clean the filter and pot after every use with a soft cloth or a clean sponge and water. Dishwasher safe.